SOLO: A STAR WARS STORY averages the same rating as I gave THE LAST JEDI - 2.5/5. The difference is that what I really loved about TLJ I REALLY loved - some of the production design and visual styling was superb. And what I hated about TLJ I really hated - the clunky humour. By contrast, SOLO was a solidly okay film, unvaryingly ok throughout, with nothing I absolutely loved, nothing I hated, just a failure to ignite my excitement or imagination, but with some nice nuanced plotting. First things first, Alden Ehrenreich is not bad as Han Solo, despite rumours of having an acting coach on set. He doesn't do a Harrison Ford impression in the way that Donald Glover tries to with Landon. He's charming and cheerful and was just fine. I thought he worked well with Chewie, and we get a lovely reverse meet-cute as Han is thrown to "the beast" and helps him escape. Is this really the blood debt we've heard so much about? Or will something happen in the contracted next two Solo movies that has more heft? Chewie remains a badass. Moreso in the modern movies. We actually do see him rip someone's arms off. But he's also lovable. Like when he goofily makes the same dumb move on the Falcon's chess set, or politely lets a girl co-pilot the Falcon until it's clear she has no clue. More meaningfully, we get a great thematic storyline here about slavery and freedom played out through Chewie freeing slaves in a mining colony that echoes what we know about his own people enslaved on Kashyyk. I hope we get to see more of that in later films. This story is also echoed in L3's storyline about freeing enslaved droids. This brings us to the next pairing - Lando and L3. This is truly Donald Glover's moment and it's true that he brings the swagger to Lando with his awesome collection of capes. It made me truly sad that we didn't get Billy Dee Williams in the new films. 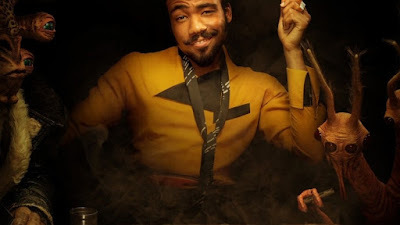 Many people said we should've had a Lando prequel and I guess that hyped up my expectations for this character. To be sure Glover is good, but I felt that his relationship with feminist cranky droid L3 (Phoebe Waller-Bridge) just didn't jive for me. I wasn't upset when she died. And I felt her witty one-liners weren't landing for me. I didn't laugh once at her. I didn't care when she died. And then lessened Lando's storyline. She also has a weird design - what's with those hips? Overall, a fail - and epically so compared to the awesome droid in ROGUE ONE. The funny thing is that when it comes to swagger, Paul Bettany's ganster baddie, Drydon Vos, arguably has more swagger and cape-game than Lando. And Woody Harrelson's gang leader Tobias Beckett brings more of the casual comedy and roguishness than Alden Ehrenreich ever could. These are the characters that actually brought some fun and panache to the film! Poor Thandie Newton as Beckett's wife Val is fine but gets little screen time. (Did filming WESTWORLD get in the way?) In fact, I cared more about the CGI creation Rio (voiced by Jon Favreau). So the plot basically sees Han meet cute with Chewie - join Beckett, Val and Rio on a heist - fail to get the goods - promise Drydon Vos to try again - only to be last minute jacked by a bunch of Marauders - and betrayed by both Beckett and Han's love interest Qi'ra (a feisty and fun Emilia Clarke who apparently knows kung fu). The Marauders have some of the coolest designed costumes and their leader, Enfys Nest (Erin Kellyman) is actually a proton-rebel and does all the scene stealing I'd expected Lando to do! In fact, I want a film about her! One also wonders if she's a candidate for Rey's mum. As for Qi'ra her eventual betrayal is really just an avenue to reveal the existence of Darth Maul as a criminal mastermind. I know this confused some of my friends, and you'd have had to be watching The Clone Wars and Rebels to be up to speed with how Maul survived apparent death at the hands of Kenobi though sheer force of evil will, fashioned new legs from trash, and rose to lead a criminal alliance against Darth Sidious. At any rate, from being basically a fun costume in the prequels, he's become one of the more interesting characters in the EU, and if there are more SOLO movies, then this will be super-interesting to explore. This sums up how I feel about SOLO: It's visually well-designed and the story is neat. Not just in a macro sense - bringing back Maul is awesome - but in how it ties down little things like why Han hugs Lando that way in EMPIRE - checking for cards. I also loved the themes of freedom vs slavery. I think Ron Howard failed to make the action scenes sufficiently exciting, and that cinematographer Bradford Young didn't light the entire movie bright enough to see all the detail in the sets and costumes. And I feel that for me some of the humour - especially around L3 fell flat. I could've watched this at home rather than in the cinema - it isn't urgent or visually grand enough. But it's a story I will follow through with. And it's far less divisive and frustrating than TLJ. SOLO: A STAR WARS STORY is rated PG-13 and has a running time of 135 minutes. It is on global release.